This artist is giving London a makeover. By Kevin Holmes. 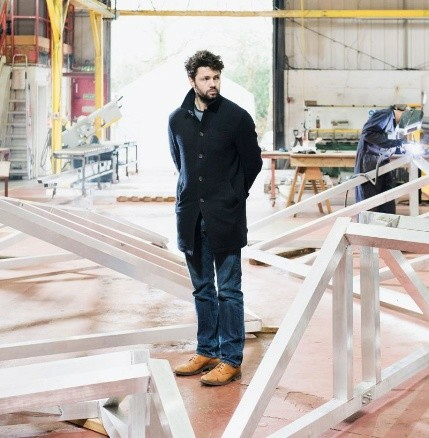 Inspired by camouflage and cubism, Conrad Shawcross is refashioning the Big Smoke's skyline. Artist Conrad Shawcross finds beauty in machines. His mechanical sculptures - constructed from steel or wood and brought alive with motors, lights and cogs - pay homage to inventors, mathematicians and scientific pioneers. His ongoing Ada Project (named after Ada Lovelace), for example, is a hacked welding robot that dances, creating mesmerising light patterns. Musicians live with the robot for a week, creating music in response to its choreographed movements. Timepiece explores celestial timekeeping, and his Paradigm series is based on the mathematics of tetrahedrons. Shawcross's latest work is The Optic Cloak, a 49m-high structure on the 600,00m2 Greenwich peninsula in London. Debuting later this summer, it's actually a chimney flue, part of Greenwich's low-carbon energy centre, and coated in a new dynamic surface. "My proposal was quite radical in that it removed the entire frame surrounding the chimney and replaced it with a much lighter, more efficient one," explains the 38-year-old. "It has a triangulated structure with perforated panels, forming a translucent skin that allows the wind to pass through it."